As colder temps slowly begin to descend upon us, some people prefer to hang-up their gear in favor of slippers and a warm bed. But for other backpackers, they really get excited about the new challenges and experiences hitting the trail over the next few months provides. 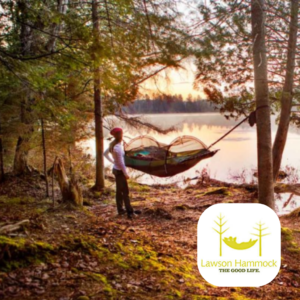 Backpacking in the Fall and Winter not only gives way to new experiences, it’s also a great opportunity to try out new recipes and work on your cooking skills, and there are a lot of recipes available to keep you warm when the snow starts to fall. 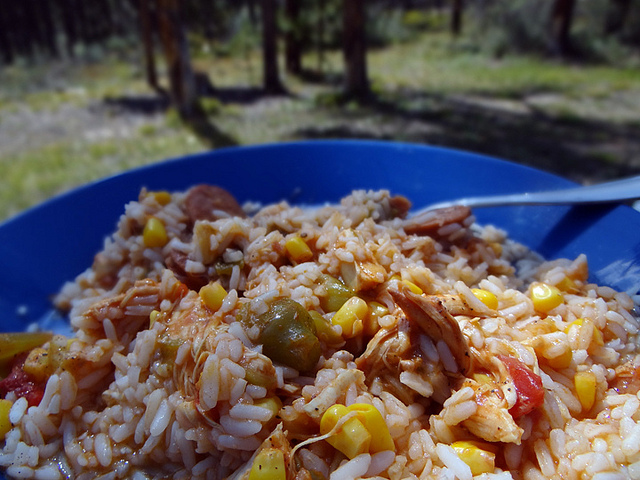 Here are 5 hearty recipes for cold weather backpacking to help fuel the long hikes during those cold weather trips. 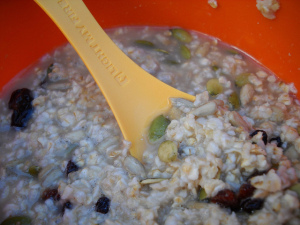 A hearty breakfast to provide the energy for keeping warm and for hiking during the day. 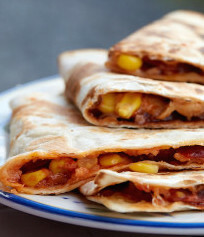 It’s an easy meal to prepare in the morning, but its benefits last well into the day. By adding in some Muscle Milk® powder, you’ll get a nice little boost with the extra protein – Serves 1. At home: combine all ingredients into a quart sized freezer bag. On the trail: if you are using the freezer bag cooking method: Add 1 cup near boiling water and stir well. Add more water as needed. If you are cooking with one mug: Add 1 cup boiling water and stir well. Add more water as needed. This recipe requires putting those food dehydrating skills to use. But after rehydrating the contents on the trail, you’ll have a tasty, warm meal in the middle of the day and all the extra preparation will be a big payoff – Serves 3-5. In the kitchen: Work bread crumbs into ground meat with your fingers and set aside for a moment. 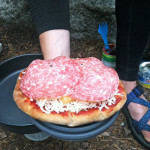 I add bread crumbs because dehydrated meat infused with bread crumbs rehydrates better on the trail. Also, the bread crumbs absorb and lock in more of the chili flavor. If you are not planning on dehydrating this chili recipe for backpacking, there is no need to add bread crumbs to the meat. You can make your own bread crumbs by dehydrating bread. Sautee onions and garlic in a little olive oil using just enough to coat the pan. It really helps to use a non-stick pan. Add ground meat and cook for about ten minutes until browned, stirring continuously. Add chili powder and cook for one more minute. Add tomato puree, diced tomatoes and drained beans. Cook until bubbling and then reduce heat to a simmer for one hour. Dehydrate: Have a taste and put the rest in the refrigerator overnight. The extra time enhances the flavor. Hitting the trail in the morning? Start dehydrating immediately. Spread chili out on the dehydrator trays covered with non-stick Paraflexx® Sheets or parchment paper. Dehydrate at 125° for 8 – 10 hours. This recipe took up three 15 x 15 Excalibur Dehydrator trays. After about four hours in the dehydrator, break up any meat and beans that might be stuck together with a spoon or your fingers to expose pieces to more air circulation. Once dry, divide dehydrated chili into one cup or larger servings and pack in plastic zip-lock bags. Yield: Five cups weighing about 12 ounces dry. 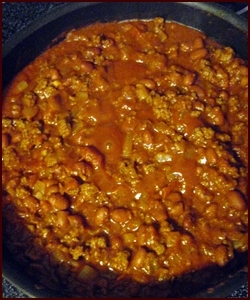 On the Trail: Combine one cup chili with one cup water and let sit for about five minutes. If you are cooking a larger serving, just add an equal part of water to your dried chili. Light stove, bring to a boil and continue cooking for one minute. Remove from stove and place pot inside insulating pot cozy for ten minutes. You’ll have those dehydrating skills put to the test again, but a hearty bowl of chicken gumbo is a tasty reward and a great way to provide some added warmth for a good night’s sleep when the temperature drops – Serves 2. At home: Combine all ingredients in a 2-quart ziplock bag. Combine all ingredients with the 3 cups of water in pot and soak for five minutes. Remove pot from stove and wait ten minutes. Insulate pot if possible. 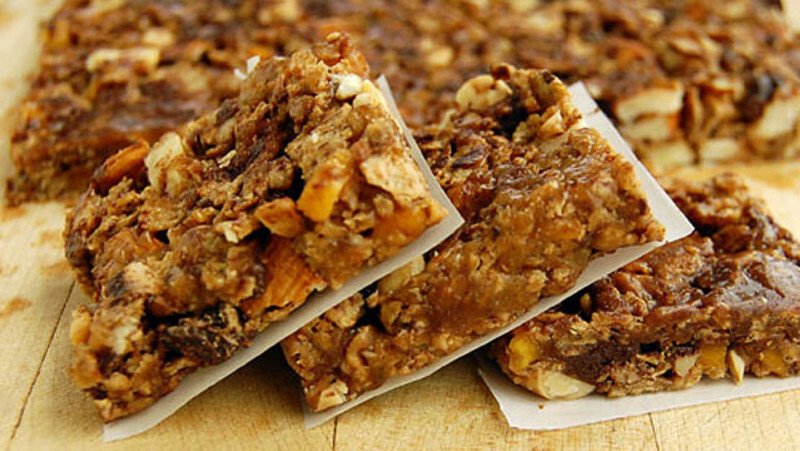 Nothing provides a good pick-me-up any time of year like homemade energy bars. Packed with nuts, dried fruit and maple syrup, these energy bars will provide you with good, healthy fats and replenish those calories lost from keeping your body warm. Chop the dates and combine them with the maple syrup, vanilla, orange, salt and spices. 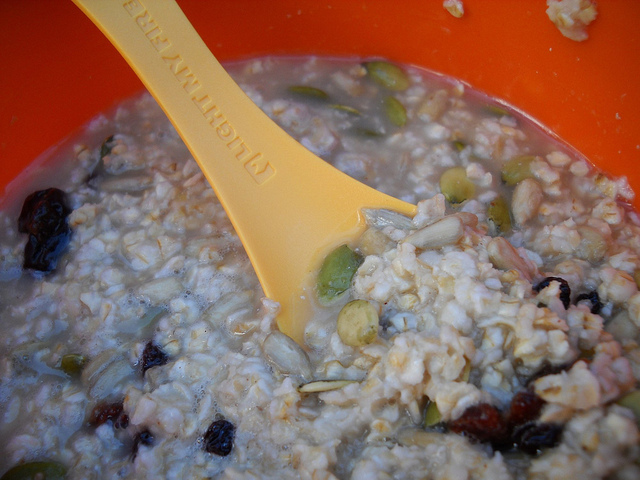 Stir in the currants, nuts and granola until you have a firm consistency. On a lightly oiled baking sheet, roll out the mixture to a uniform thickness of about ½ inch. Chill in freezer for 15 minutes, then cut into bars. Pack the mini marshmallows in a small bag. In another small bag, add in the cocoa and dry milk, seal tightly. Take the liquor in a small bottle. A packet of hot cocoa mix can be substituted for cocoa/carob and milk powders. 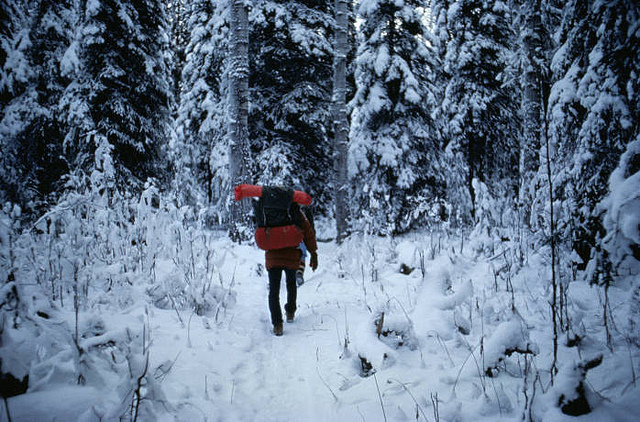 While the weather may be chilly on your trips, you’ll be able to stay warmer with a little extra planning and preparation. So cosy up next to a campfire, grab your favorite hot drink and enjoy those cool crisp nights with a belly full of good food! Ryan Rankin currently lives in San Francisco, but grew up fishing and hanging out in the woods of northeast Wisconsin. When he’s not busy with work, he likes to head into the Sierras and around Lake Tahoe for some good hikes and a little tenkara fishing. You can follow more of his writings at The Amateur Outdoorsman.